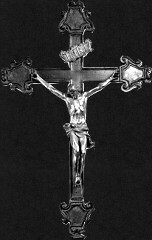 The cause of our trouble in the world is sin. 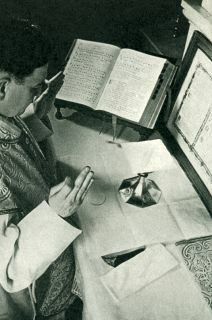 Peace of soul and a perfect resignation to the goodness of God present in the Most Blessed Sacrament destroys hatred and the possibility for sin. 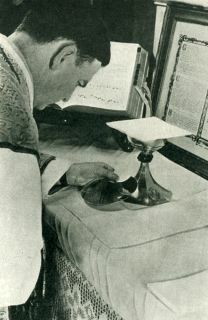 After the Consecration, you will observe that the priest makes several genuflections in reference to our Lord in the Blessed Sacrament. 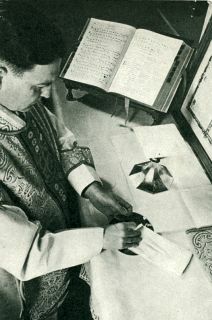 You have noticed that the priest has also made several crosses over the Consecrated particles or species, all commemorating the acts of our Lord at the Last Supper. 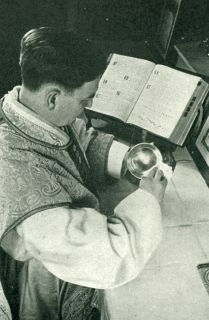 He now breaks the bread as our Lord did placing one-half on the little dish called the Paten and he holds the other portion in his left hand. 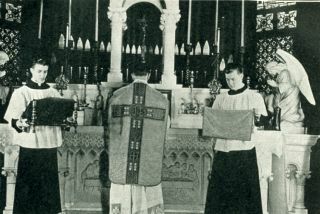 After each recitation of this prayer, the server rings the bell (three times). 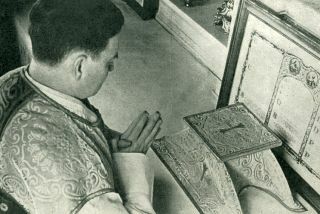 Having received the Host, the priest with eyes cast down, pauses to pray silently for a few moments. 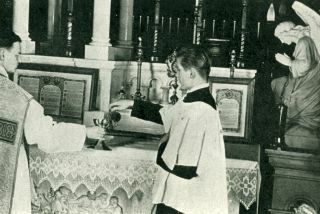 At this point in the Mass the Faithful who are to receive Communion proceed to the Communion rail and those who cannot receive offer up their hearts and souls in spiritual Communion. 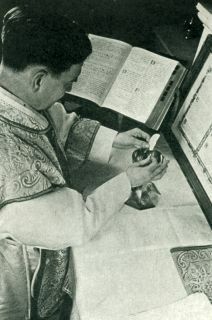 Spiritual Communion is nothing more than a real and sincere desire and wish to receive our Lord in Holy Communion if you could. 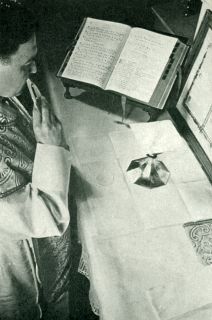 “Grant, O Lord, what we have taken into our mouths may be received with a pure mind: as a temporal gift, may it become unto us an eternal remedy." 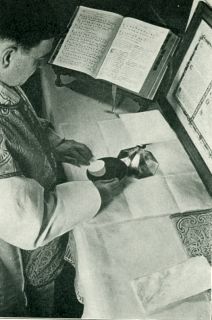 After drying his fingers on the Purificator, the priest consumes the second ablution as you have noted and wipes his lips and the inside of the Chalice with the Purificator. 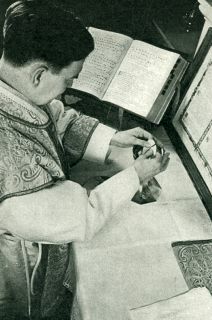 He then reassembles the articles on the altar. 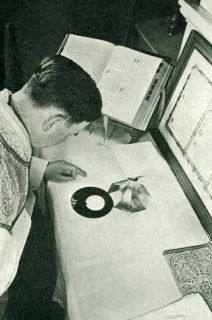 The servers carry the veil and the book and place them as follows: the veil on the Gospel side and the book on the Epistle side where the Communion prayer is read. 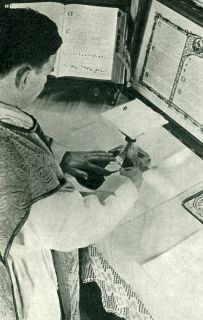 It consists usually of a single verse of scripture of a joyful nature and also varies with the feasts and seasons of the year. 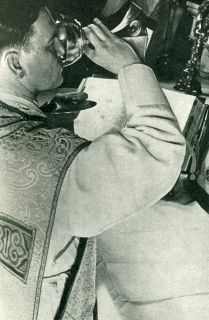 This prayer was called the Communion because it was said by the Faithful in the early days of Christianity and chanted by the choir during the distribution of Holy Communion. 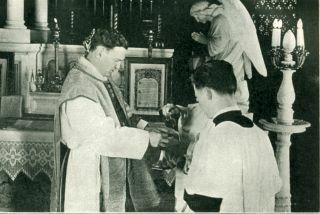 The priest then returns to the right side of the altar again. 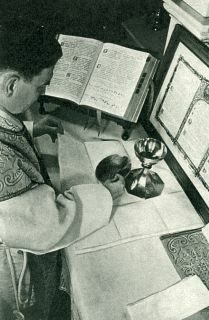 These prayers are called Post-communion since they follow as a thanksgiving after Communion. 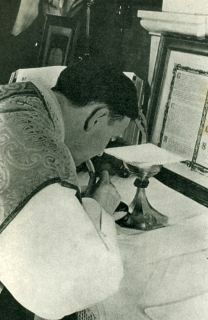 Mention is always made of the Body and Blood of Christ which has been received. 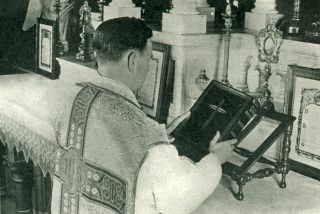 At the conclusion of these prayers, the priest closes the Missal and returns to the center of the altar. 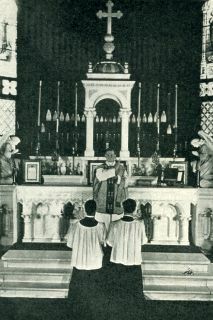 You will observe that the priest does not sign himself but raises his hands in benediction over the congregation.